As I mentioned in my parenting priorities post, I have pretty much raised Brittlynn exactly the same way I did Kye. Zach and I feel that what we did with Kye as a baby has given us the results we were hoping to have at the preschooler age so why change anything? Of course, I started with Babywise sooner with Britt because I didn’t know about it with Kye. I also feel it’s been way easier to follow Babywise because I already know what to do, how to do it, and how the hard work pays off. The first major thing I decided to change in the way we are raising Britt from the way we did Kye was with solid foods. Not that Kye is some horribly picky eater…but I do wish he’d enjoy healthy choices more. I’m hoping by doing things differently with Brittlynn that we’ll have a better outcome when she’s Kye’s age with how she enjoys food. Only time will tell! It’s not the ONLY reason that I decided to go a different route. As I mentioned in the post about Kye’s eating, I didn’t ENJOY feeding him solids. The whole experience was pretty stressful, overwhelming, and just overall miserable. I didn’t like it one bit!!! My dad always says if you’re not happy then change something…and I wasn’t happy with our solid food experience the first time around. So I changed it! I refused to allow myself to feel any pressure to rush into feeding her solids. I decided that nothing would touch her lips other than breast milk prior to 6 months old. According to Baby Led Weaning before the age of 6 months old digesting anything other than milk is difficult for babies. It’s not good for them to have food prior to this age because: only breastmilk or formula can provide the concentrated easy to digest source of calories and nutrients that their small tummies can handle, the digestive system cannot yet get all the “goodness” out of solids so it passes right through their system without giving any nourishment, if you introduce solids too early their appetite for milk feeds goes down which further lessens their nourishment, and since babies under 6 months old have immature immune systems their at a higher risk for developing allergies if given solids too young. So I waited. I waited and waited and I kept on waiting. Even when she hit the six month marker I put it off. I was still hesitant because I didn’t want the hassle of solids. You know only what you’ve experienced and my past experience wasn’t that great so I wasn’t super pumped to be dealing with it all again!!! I nursed her at her 11:00 feeding then got Kye’s lunch ready and fed them both at the same time. It’s important to nurse first since it IS her main source of nutrition. It was CRAZY to me how ready she was. Seriously. BLW (Baby Led Weaning) says the way you can tell if your baby is ready for solids is that they will be able to sit up with little or no support, reach out and grab things and take them to his or her mouth quickly and accurately, and is gnawing on toys and making chewing movements. The best way you’ll know if your baby is ready though is if she can put the food into her mouth herself. Um. This girl was BEYOND ready. I felt like she’d been ready for awhile as she was so interested whenever we were eating but when I put that banana in front of her she grabbed it and put it in her mouth before I could even snap a picture!!! I didn’t use a bib or anything because I wanted her “first food” pictures to be cute 😉 Another reason I chose banana because I knew it wouldn’t stain haha. She went to TOWN on that junk!!! She sucked on it a good bit and it amazed me to watch how naturally she knew what to do. The best part was I didn’t have to do ANYTHING. I stood by and watched just to make sure she didn’t choke (more on choking next post) and I had to keep putting the fallen pieces back on the tray, but it was WAY easier than spoon feeding her. I was able to help Kye get more milk or clean up his lunch. I wasn’t tied down in the way I would be with spoon feeding. It also made Kye want to eat some banana too as he wanted to be like his sister. He was so proud of her! Up until 1 years old babies don’t NEED any solids. Breastmilk and/or formula provides them with all the nutrients they need. For several months babies will often just use their solids to explore. BLW said she probably wouldn’t even actually swallow any of it.That she’d just enjoy playing with it and that it’s a great opportunity for her to be learning. I wasn’t stressed over making sure how much she ate. She decides when she’s done nursing, why shouldn’t she also decide when she’s done eating??? Zach and I don’t believe in making Kye “clean his plate” so why would we force her to eat a certain amount? BLW talked about how babies will get food in their mouths, play with it in their mouths, then spit it back out. She did this from day one! You can see her spitting out the piece of banana in this picture. I LOVE how excited she is in this video! You can also see why it’s important to give “finger” shapes to them because she couldn’t grab the small pieces with her fist yet. Seeing how much SHE enjoyed it made me feel SO MUCH more at ease about everything. With spoon feeding it takes awhile for the baby to adjust to it and learn how to eat food from the spoon. It’s not enjoyable to watch but letting her explore the food on her own WAS an enjoyable experience for me! Kye kept laughing too and Brittlynn was as happy as could be! She doesn’t drop much off of her tray onto the floor but when she does I correct her for it. I tell her “food stays on the tray” and put it back on the tray (We are ALL about the 5 second rule in our house…). She’s not old enough to do it intentionally yet but I will discipline as needed when and if that time comes (with Kye it was never an issue). You can see where MOST of the food ends up!!! Since I wasn’t prepared with a bib or for the mess I bathed her off following her first solid eating experience. I don’t do this now…you’ll see in the next post that I have it down to a science 😉 I didn’t expect to see a change in her diaper but the very next poop one was more solid!!! And it had chunks of banana in it! Not only was she enjoying playing with the food, exploring and learning about it but she was actually eating it too. 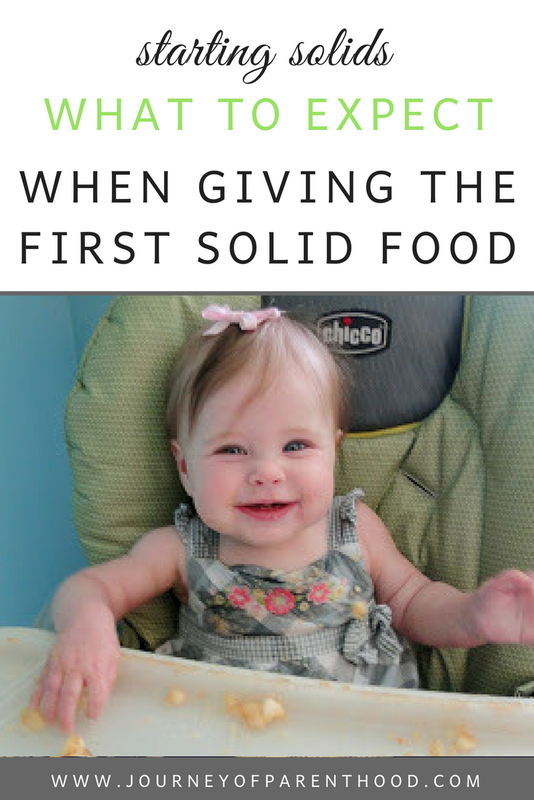 It was so great to KNOW, without a doubt, that she was ready for solids and that I found something that made the entire experience happier for us all! I wanted to keep this post just about her FIRST time eating…my next one will cover more of the book BLW and what I found helpful about it. 🙂 I’m thankful I waited as long as I did to introduce solid foods and I’m SUPER thankful that I found the BLW book…it really has blessed my life and Brittlynn’s life as well! She is soo cute ! I love her little face! I think they look different as you go back and compare pics of Kye and Britt. Such an amazing family! I love watching you guys grow! And I love your posts on babywise! I cant wait to use it one day! Hi Emily – I am a random follower but I just wanted to let you know that I am THRILLED that you are blogging about BLW! I had my first baby in April and just decided in the past few weeks that I think BLW is the way to go for us when it's time to introduce solids (we still have about 3 months to go). I'm really interested to hear your take on the process and how things are going for you and Brittlynn. Thanks again! Em, did you roll the banana in something before you gave it to her? It looks like it has something 'sprinkled' on it! Just curious if that was like a 'sneaky chef' way of giving her something else besides just banana!